Photo shows sites of two of Mazatlan's "firsts": Neveria Hill (rear of picture) and the historic Hotel Belmar, opened in 1920 on Olas Altas. Besides the dubious distinction of being the first city on this side of the world to be bombed from the air, Mexico's Pacific port at Mazatlan was home to the country's first beach resort - at a time when today's playlands at Acapulco, Cancun, the Riviera Maya, Los Cabos, Ixtapa and the like were mostly just barren stretches of sand. Think of the pressure that must have been on Mexican rebel pilot Gustavo Salinas. It's 1914, during the Mexican revolution, and he's about to make history by bombing a federale fort from his rickety biplane. What's more, the 21-year-old pilot is being closely watched by the guy who ordered the raid, General Venustiano Carranza, commander of the Northern Revolutionary Constitutionalist Army (Carranza is also Salinas' uncle). When he had flown the plane to the right place (he thought) over the fort, Salinas told his co-pilot to drop a makeshift bomb - a pigskin packed with dynamite, coal and nails - he'd been nervously holding in his lap. Ay, caramba! The bomb missed the fort, instead wiping out a shoe factory a few blocks away. But the day was saved when Carranza told his nephew to take another shot at the target. On the second run, Salinas might have improved his aim, or just gotten lucky (or perhaps a bit of both), but he somehow managed to hit the fort and blast it into smithereens. Read more about pilot Salinas and General Carranza later in this story. The action took place over a spot named Neveria Hill in what's now western Mexico's booming beach resort at Mazatlan. Overlooking the city, the hill is honeycombed with limestone caves at one time used to store ice imported from San Francisco on sailing ships (thus giving it the alternate name of "IceBox Hill"). Dozens of luxury resort-hotels line Mazatlan's main hotel strip, the Zona Dorada, about a 20-minute cab ride from Neveria Hill and Olas Altas. Later on, the caves were used to store ammunition for Mexican forts on the hill. Over a 17-year span in the mid-1800s cannons poking out of the forts exchanged blasts with American, then British, then French ships blockading the harbor. Neveria Hill, today bristling with microwave towers and luxury homes, frames one side of a six-block beachfront strip called Olas Altas (the other side edges a park named after General Carranza). The strip itself claims a number of firsts for the country, one sparked 2,000 miles away up in the States in 1920 when politicians raised their hands to enact a law outlawing booze in the U.S.
"Soon, speakeasies (illegal bars) had popped up all over the U.S., but Prohibition was a great excuse for merry-making Hollywood stars, studio execs, oil barons and other miscellaneous moguls to hop on their yachts and sail down here to get a drink," reporters were told by Gilberto Limon, Mazatlan's legendary public relations man. And where did the celebs bunk down? Local historians believe the first beach resort in Mexico to cater to the foreign silky set was along Olas Altas. And their favorite watering hole was the still-standing Hotel Belmar. Planned as a warehouse in 1919 by mining baron Louis Bradbury, the building opened for business in 1920 as a luxury hotel - not-so-coincidentally at the onset of Prohibition. John Wayne's room at the historic Hotel Belmar. According to Limon, the hotel was once the playground of the likes of John Barrymore, Rudolph Valentino and Mae West and later on John Wayne, Betty Grable, Rock Hudson, Jimmy Stewart, Ava Gardner and filmdom's bad boy Errol Flynn. After checking in to their then-opulent rooms at the Belmar, and perhaps taking a stroll around the hotel's plush, gilt-lined hallways and exotic gardens, the gentlemen put on tuxedos while their ladies slipped into crushed velvet gowns for a gala night of dinner and dancing in the Belmar's elegant ballroom. Rudolph, Rock, Jimmy, Mae and the gang were probably unaware that imported boa constrictors were slithering around below them in the basement, ridding the hotel of mice and rats. Mae's beloved Schnauzer reportedly disappeared, too. Restored opera house in the Historic District was first opened in 1874. Guests staying today in the partially renovated Belmar and other properties on Olas Altas can walk a few minutes inland to Mazatlan's 180-block downtown Historic District. There, visitors mosey around hundreds of spruced up colonial mansions, art galleries, sidewalk cafes, museums, jazz clubs, boutique hotels and the city's two crown jewels: a restored, neo-classical opera house and the block-long Plaza Machado oozing old-world charm and lined on three sides by restaurants and bars. 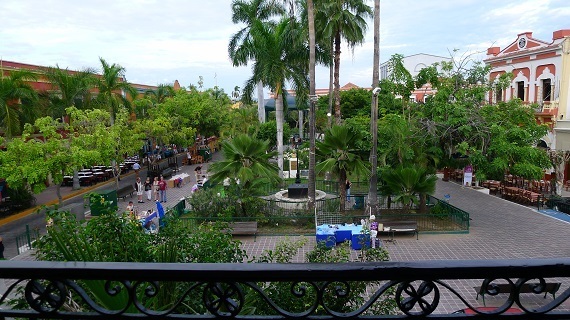 One of the city's treasures is the Plaza Machado, nearly 200 years old. Revelers whoop it up in the plaza on Mexico's Day of the Dead. Fast-forward again, this time to 1963 when Carlos Anderson - reportedly on the lam from a busted hot dog and taco business in Mexico City - wound up working in the restaurant of the La Siesta Hotel, another grand dame on Olas Altas. 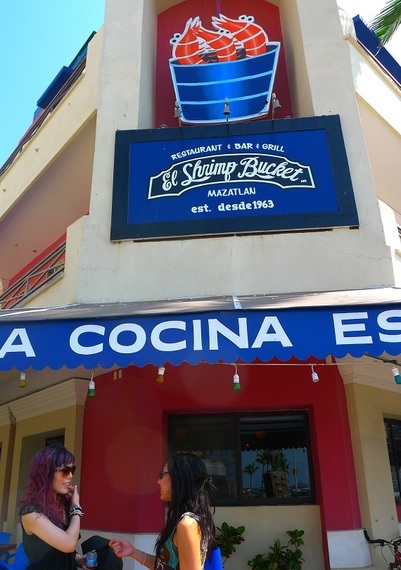 Limon, now deceased, loved to tell the story of how the 25-year-old entrepreneur talked the hotel's owner into revamping the restaurant, El Shrimp Bucket, into a fun experience - and the first of what turned out to be a global chain of such spots. "I guess you could describe Anderson's place as something like the Rolling Stones meet Pancho Villa," Limon said. "Guests sat at beat-up tables along walls decorated by photos from the Mexican revolution while rock music blared from tinny speakers. Sometimes the waiters sang along. It was fun for everyone." Diners who wore ties to the restaurant quickly found out - the hard way - that such clothing articles were no-no's at El Shrimp Bucket. Anderson personally cut off their ties and nailed them to the walls and ceiling. At one time Mazatlan's El Shrimp Bucket touted its founding 53 years ago. From El Shrimp Bucket came the worldwide Carlos'n Charlie's restaurant group with names like Senor Frog's, Carlos O'Brien's and El Squid Roe. For the record: Globally, the attack on Mazatlan from the air was preceded only by one in 1911 by an Italian plane over Tripoli, Libya, in the Turkish-Italian War. Pilot Salinas' exploits at Neveria Hill and in later air raids were recognized by several promotions. He retired as a major general in charge of the Mexican Army Air Force. Carranza was named the first president of the new Mexican republic at the end of the war.